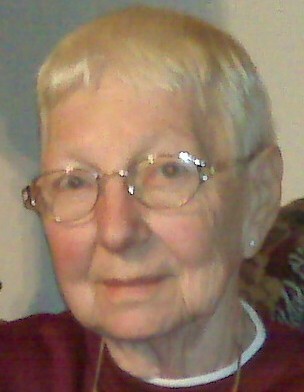 Elizabeth M. Bardoczi “Betty” age 93 of Hammond passed away peacefully on Monday, February 11, 2019 in her home. Betty is survived by her loving husband and best friend of 71 years, Emery James Bardoczi Sr., their son, William (Margaret) Bardoczi; daughter-in-law, Ida Mae Bardoczi; 4 grandchildren, Laura (Ken) Dienes, James (Amanda) Bardoczi, William and Gregory Bardoczi; 2 great grandchildren, Lily Mae and Lexie Marie Bardoczi; sister, Patricia Caston; many in-laws, nieces, nephews, friends and her four legged companion Max. She is preceded in death by her parents, William and Elizabeth Brabbs, son, Emery James Bardoczi Jr., 2 brothers, William and John Brabbs, and sister Shirley Sliwa. Betty was born in Chicago, and married Emery in East Chicago in 1947. Betty was a past den mother for the Cub Scouts. She was a faithful parishioner of Our Lady of Perpetual Help Church where she was member of the Quilters group and past president of the Rosary Society. She took great pride in caring for her husband and family and enjoyed quilting with fellow church members, creating many quilts for fund raising efforts. She also prized her Dahlias and other flowers in her garden. Friends are invited to meet with the family for visitation on Friday, February 15, 2019 at Bocken Funeral Home 7042 Kennedy Ave. Hammond (Hessville) IN 46323 from 3 p.m. – 8 p.m. Funeral Mass of Christian Burial will be on Saturday, February 16th at 10 a.m. DIRECTLY at Our Lady of Perpetual Help Church 7132 Arizona Ave. with Rev. Charles Mosley, celebrant. Betty will lie in state Saturday in church from 9:30 a.m. until the Mass. Burial will follow at St. John Cemetery, Hammond. In lieu of flowers, memorial donations may be made to Our Lady of Perpetual Help Church. For additional information please contact Bocken Funeral Home 219-844-1600 or www.bockenfunerals.com.